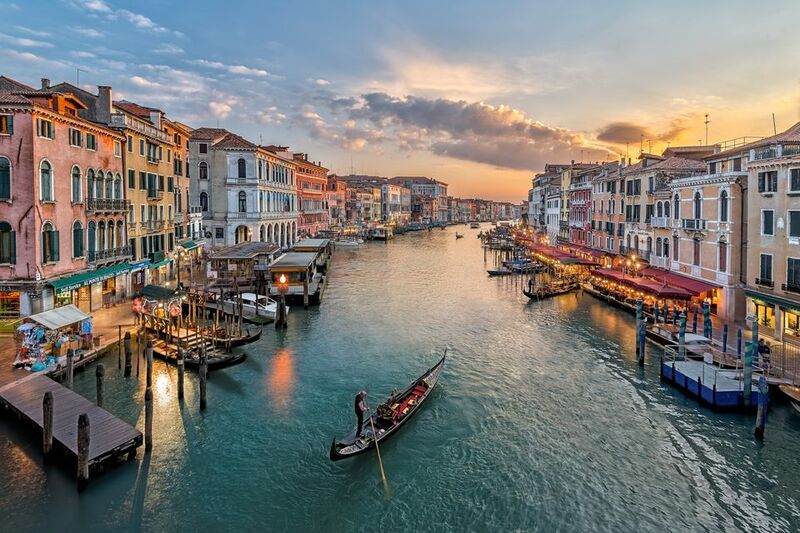 Venice is a beautiful city to visit, and certainly has enough attractions and diversions to keep you busy for at least several days to a week or more. But if you have the time and want a break from the canals of Venice, there are many excellent nearby options for day trips as well. The Veneto region holds interesting towns and cities outside Venice, most easily reached by public transportation. Murano, Burano, and Torcello are the top three islands to visit on day trips from Venice. Murano is known as the island of glassmakers, Burano has canals lined with picturesque colored houses and is known for lace making, and Torcello is a green island where you can see Byzantine mosaics in the 7th-century Cathedral. Getting There: From Fondamenta Nove, Vaporetto Number 41 or 42 to Murano, or Number 12 to Burano and Torcello. Venice Lido is a long strip of land off the Venice coast. The Lido is lined with beaches and is a good place for nightlife, shopping or to get away from the tourist crowds in Piazza San Marco. In early September, the Venice Film Festival is held on the Lido. There are shops, restaurants, bars, and hotels (often less expensive than in Venice) on Venice Lido, as well. Getting To the Lido: Vaporetto Number 1 from Piazza San Marco. Vaporetti run from other parts of Venice, too. Read more about going to the beach in Italy. Along the Brenta Canal between Venice and Padua are a number of beautiful ancient villas, some designed by famous Renaissance architect Andrea Palladio. Although most can only be viewed from outside, some of the former gardens are now public parks and a few villas are open to visitors. Getting There: You can take a bus that runs from Venice (from Piazzale Roma) to Padua, stopping in Mira or Stra, although the best ways to visit are by boat or car. Padua (Padova) is a walled city east of Venice. It has Europe's oldest botanical gardens, the Basilica di Sant’Antonio, and Scrovegni Chapel frescoes by Giotto. The gardens and Basilica are across town from the train station, a pleasant walk through the historic center. Getting to Padua: Trains from Venice to Padova take about half an hour and run frequently. Treviso is a pleasant medieval town north of Venice with canals and alleyways running through its center. The defensive walls, town gates, and moat can still be seen. Treviso's center, a short walk from the train station, is a nice place for wandering or enjoying a drink in a cafe. Getting There: Trains from Venice to Treviso take about half an hour and run frequently. Chioggia, a fishing port in the Venetian lagoon, is sometimes called "Little Venice." A wide pedestrian street lined with cafes and restaurants runs down the center of town to the port. Chioggia has a great morning seafood market, clock tower museum, and the Museum of the South Lagoon. Beaches are 2 km from the center. It's a nice place for relaxing and good for day trips to Venice in ​the summer. Getting to Chioggia: In summer, a direct tourist boat runs from Saint Mark's Square to Chioggia. At other times, vaporetti or train connections can take two hours. Vicenza was an important city from the 15th through 18th centuries. Famous Renaissance architect Palladio was from Vicenza and he designed 23 of the buildings in the city, including Palazzo Barbaran da Porto that houses the Palladio museum. The Basilica Palladiana is considered by many to be Palladio's masterpiece. With a car, you can tour Palladian villas outside Vicenza. Getting to Vicenza: Trains from Venice to Vicenza take about forty-five minutes and run frequently. Verona, sometimes called the Florence of the North, is famous for the house and balcony said to belong to Juliet in the Shakespeare story, "Romeo and Juliet." Verona has a 2,000-year-old Roman Arena where summer opera performances are held, a Roman bridge and a market square that was once the Roman Forum. Verona is one of Italy's most visited cities. Getting There: Trains from Venice to Verona take between 60 and 90 minutes. Bassano del Grappa is a pretty medieval town below Monte Grappa on the Brenta River. Bassano del Grappa is known for its Alpine wooden bridge, grappa, and ceramics. It's a pleasant base for exploring the nearby Venetian villas, castles, towns, and attractions of the Veneto region. Getting There: Trains from Venice to Bassano del Grappa take about 90 minutes. Original article by Martha Bakerjian.